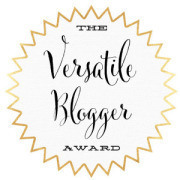 I feel very humbled to have received the Versatile Blogger Award from Art by Rob Goldstein. Thank you so much. Share seven facts about yourself. Nominate up to 10 other bloggers. I care about other people’s welfare too much. Fonzandcancer Blogging Daily To Encourage. Originally from Bronx, New York, Joe is no stranger to adversity. Having studied many philosophies, he has triumphed over these adversities and has helped others do the same. Professionally, Joe has had the rich experience of working with people with disabilities as he helped them reach their fullest potential. Now, as the creator of the "What I Gotta Say About It" blog, Joe continues to influence the world as he helps people to realize their highest potential and to reach for the unlimited possibilities available to us all. Congratulations! You got hit by a bus, oh my goodness! Are you able to help whith whatever they need? Wow. That is some extreme prep! I am glad you are alright and could be there for your brothers. Thank you so much for nominating me!!!! Thanks for accepting the nomination. You’ve got a great blog and an open mind.